Bread baskets are suited for servicing at weddings, outdoor picnics, corporate affairs, and special events. 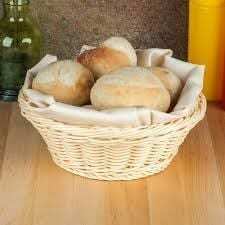 Unlike woven wicker or willow baskets that become brittle with use these baskets are durable and not only look great but are easy for guests handling. Keep a few of these handy baskets on the table or at the buffet. Ideal for various breads, rolls, candies, crackers, finger foods and other snacks. DIMENSIONS: Diameter (top) – 8 Inches Diameter (base) – 2 1/2 Inches Height. For a larger basket try our 14″ rectangle baskets.